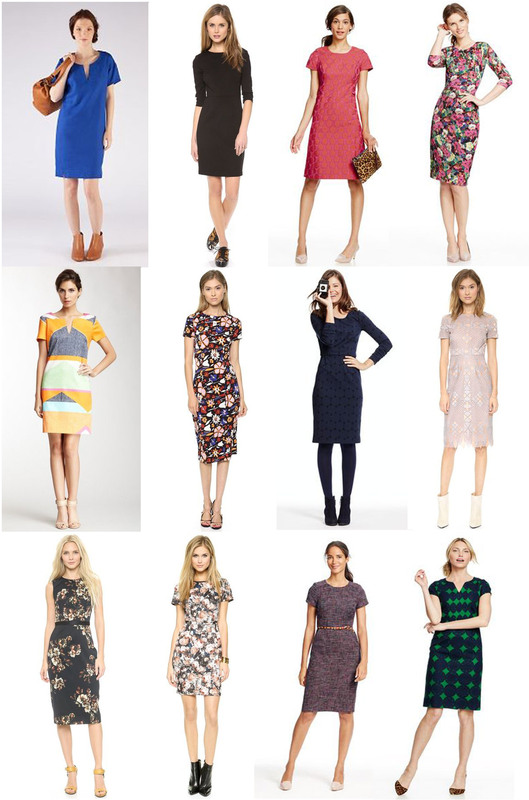 When I think of the ubiquitous little black dress, I tend to think of a classic sheath dress. You know what I mean when I say sheath dress, right? Fitted but not tight, feminine because it flatters your curves but doesn’t flaunt them, appropriate for a variety of occasions, and extremely versatile because it can be dressed up and down. Sort of like our new Bistro Dress pattern. I would describe this style as a semi-fitted dress. It’s flattering but not meant to be tight. Instead, it allows room for movement and is actually comfortable to wear while still looking feminine. It’s a dress that’s completely appropriate for work as well as for dinner or a party after work. But it can also be dressed down and can take on different personalities depending on how you style it. That’s what I mean when I say versatile. Most designers include some version of the sheath dress in each collection because it’s a style that’s flattering on nearly everyone. You may not see this style on the runway (which might be a good thing, given that runways sometimes look more like circus costumes than wearable apparel–I’m looking at you, Thom Browne), but if you visit their showroom you’ll see this dress. 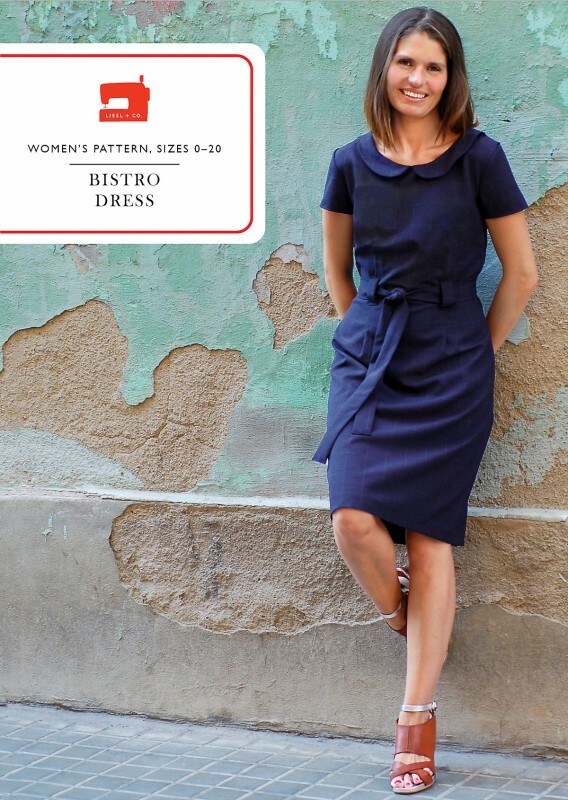 I designed the Bistro Dress pattern to be as versatile as possible, too. It includes a belt and belt loops to let you cinch in the waist for a flattering silhouette. (And also to make it easier to fit the pattern–more on that topic shortly.) 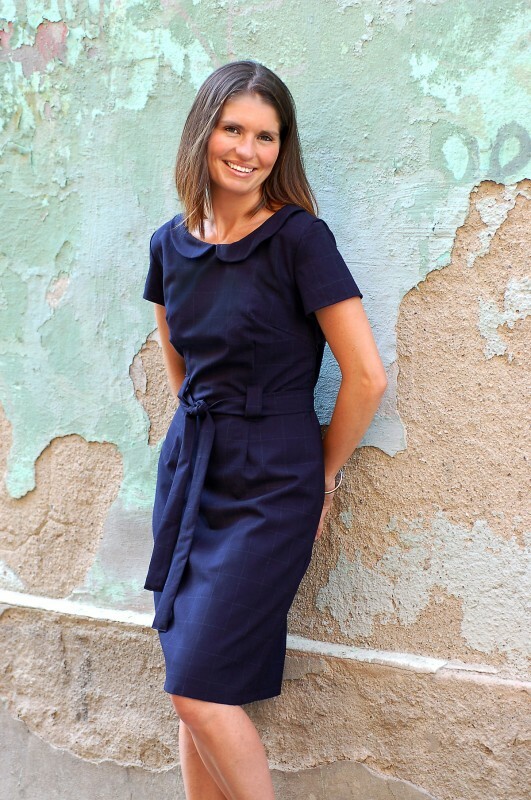 There are two interchangeable views: one view includes short sleeves and a modified Peter Pan collar and the other view features long sleeves with a notched neck. The armholes are high enough that if you want to make a sleeveless version it would be fairly easy to make those alterations, too. The pattern also includes an invisible zipper at the side seam as well as complete instructions for making the dress fully lined or with just facings for an unlined option, since different fabrics and different sewists have their own preferences. I wanted to accommodate a lot of options so you can make a dress that’s perfect for you and that you can make again and again. In order to help you get a good fit, the pattern includes bust darts and waist darts so you can adjust as needed. The instructions also include a detailed explanation and illustrations for doing a full-bust adjustment to help you get an even better fit. This dress is designed to be somewhat loose-fitting through waist and hips, but it can certainly be made more fitted if you prefer. And I’ve included our very popular instructions for inserting an invisible zipper. Many of you have told us that you used our invisible zipper instructions to sew your very first zipper (they’re part of the Fairy Tale Dress and the School Photo Dress) and were thrilled at how easy it was. I wanted you to have that same experience with this dress, too. In terms of fabric, this style is also versatile. Use wool suiting, sateen, or crepe for a polished professional look. Try twill (stretch twill works great) or canvas for a more casual version of the dress. This pattern would also be great in silk dupioni or velvet for a fancy holiday dress. It would also work really well in a stable knit like ponte de roma. Actually, I think a black wool ponte fabric would make the most versatile dress ever. You could wearing it every day, just styling it a little differently with each wearing. Next week I’ll post some fabric suggestions for each style in this collection, too! Some styling ideas? You know it. Check out my liesl and co pattern styling ideas Pinterest board for more images to inspire you. I like how you can wear this dress with anything from a denim jacket and boots to a fitted blazer and heels. And you know me; after many years of wearing a suit every day I’ve developed an allergy to anything that looks like business wear. 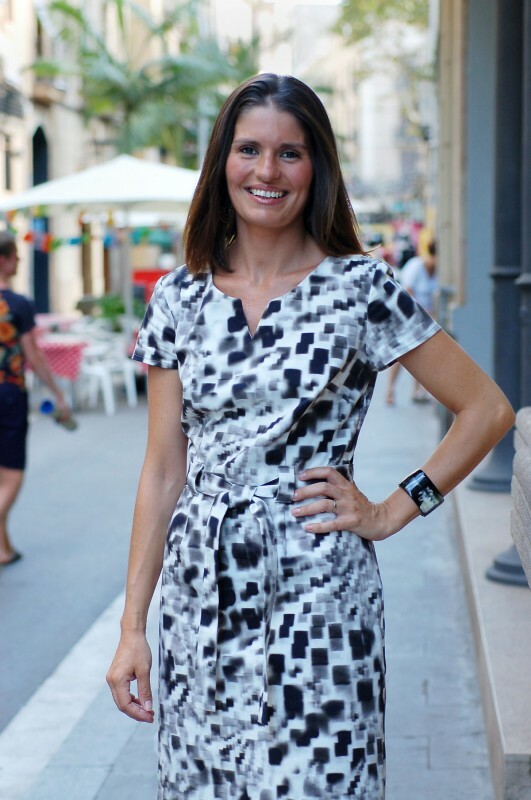 I wear this dress with strappy sandals and a casual jacket and feel perfectly comfortable. How are you going to wear the Bistro Dress? love, love love! So versatile and useful and wearable! Let’s see, I have a mustard colored lightweight twill that would be nice – with a little collar and leather belt? And a mushroom colored stretch brushed twill – and, a really lovely champagne colored guipure lace for the holidays. The only real question is which one first? This could be my new uniform dress. love! This and the cinema dress are going to be my top autumn and winter patterns, once I get the fit on. i was a bit worried after the Bento that I wouldn’t like the next one, how wrong could I be…. (don’t get me wrong, Bento’s very cute, but I am not a boxy top person – as a pear shape, I suit things that are fitted through the torso). I also love the culottes but won’t make them as I prefer dresses and skirts for work – to put it bluntly, because they make restroom visits easier and more hygienic! I love that you’ve given the option for lining or not and for belting for a close fit – Liesl, you are truly a designer who understands women’s needs. And that is a rare and beautiful thing! Yes! I’m so excited to start sewing this dress! I think it could become my new wardrobe staple for work. Thank you for the fitted sleeve/shoulder – Sorry but I’m not a big fan of the kimono sleeves that are in most of your other patterns. Love the styling – might consider trying this one! This might convince me to start wearing more dresses. Very, very pretty! Love the dark one, love the graphic one, love the one you painted, love the styling ideas with the ones with the pearl beaded collars! Polished, funky and sophisticated options all in one dress. Nicely done, Liesl! Oh, you clever clever girl! This is so fabulous! I’ll spend weeks finding a fabric worthy of this dress. I just noticed this has back neck darts. I’m impressed. One of the reasons I usually prefer vintage patterns to modern is their use of back neck darts and/or shoulder darts or ease. Most modern ones don’t use them – and then we wonder why back necks gape! I wonder – are your designs for B cups? Francesca, that pattern is designed for a B cup, but it includes detailed instructions for doing a full-bust adjustment so that you can tailor the pattern to your particular cup size. I love the timeless, classic style of this dress! It’s exactly the type of dress I look for when I’m shopping, and now I can sew my own. Thank you!! Does it offer instructions for a SBA as well? I just got the pattern, and yes, it does have instructions for a small bust adjustment too! Love the navy blue fabric that was used for the cover photo for this pattern! Are you able to share the name/brand of this fabric? Gillian, there is no waist seam on this dress. When and where can I buy this pattern? Hope its available as a paper pattern. I hate PDF! Digital only???? WHY ? I hate digital patterns and will nit buy them. Very sad, because this is a great dress.